Head of Online Marketing for Boston City Campus & Business College, Frankie Coda, admits to being a bit of a ‘late bloomer’ and while the realisation that he had missed out on applying to get into full-time university studies may have seemed like the end of world to some, it turned out to be the door to a world of opportunities for Coda. ‘I always knew I wanted to get into marketing. I discovered that it came quite naturally to me as I ran my own mobile disco for many years and speaking to an audience and getting them involved was easy. After realising that I had left applying to one of the big universities too late I visited Boston to see what they had to offer in the line of courses or certificates,’ says Coda. Boston City Campus advised Coda on various options but also recommended that he consider the UNISA BCom Marketing Management degree, which he could complete through Boston. ‘I had not considered this option, but I was happy to take Boston’s advice and enrolled for the degree,’ says Coda. For the first six months, Coda tried to ‘go it alone’ but quickly realised that studying on your own is not as simple as it sounds and that he needed guidance, tuition and the routine of having to attend lectures and hand in tutorials etc. ‘Boston City Campus was really great – they were always there to help during lectures, after class or even telephonically and studying through Boston offered me the flexibility I needed as I was working while studying so if I could not make a lecture during the day, I could make it up with one of their night lectures,’ he comments. Coda really enjoyed attending Boston City Campus and although he admits that you do not get the ‘full campus’ experience as you would at a traditional university, the staff including lecturers always go the extra mile to help you and encourage you to succeed. ‘The thing about Boston is that it provides the structure and support you need so if full time university is not an option for you then Boston is definitely the best alternative you can get,’ says Coda. After qualifying with his degree Coda wanted to start getting some experience and he managed to get a position working on the Boston Call Centre. Here he mastered the basics of marketing through cold calling, and telephonic lead conversations. He performed so well that he was soon promoted to Marketing Assistant where he got more involved in digital marketing. Coda now heads up all the online, mobile and social media marketing for Boston and is responsible for developing the organisation’s 360 degree Online Infrastructure including various elements ranging from web, mobile development and social media campaign development. While Coda is relishing his career now, he has no intentions of stopping here. He would like to gain even more experience in a fully fledged digital agency as the industry is a fast moving and evolving one and ultimately he dreams of running his own agency. Having missed out on the first deadline in his career, Coda has never missed another one and there is no doubt that this late bloomer will become a leader in his chosen industry. 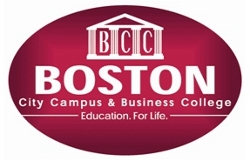 For more information on Boston City Campus or visit www.boston.co.za.